I continued this lazy Easter Weekend with a quick stop in Old City at Triumph Brewing Company. This place is a local chain, and I’d been to the one in Princeton years ago. I didn’t remember it very much. I guess it wasn’t that memorable! The spot in old city is surprisingly big. 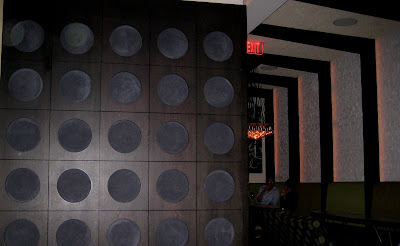 The downstairs has a big bar that takes up the whole right side, there are a good number of tables alongside the bar. On the other side are a bunch of booths. There are several large sections that are “lounges”. And upstairs there’s even more dining and a small bar. There have many large tables to accommodate large parties. The place looks pretty cool… lots of clean lines, dark woods, some mod decor. It wasn’t very crowded (which was nice!) and when we first got there, it was pretty chill, and they were playing some classic rock on the speakers at a decent volume. We sat in the lounge area which had tables on wheels that looked like a surfboard. There were some barcelona-esque style chairs with retro fabric, which looked cool, but didn’t really make for the best seating. It was nice to be tucked away from the general bar noise and crowd. We didn’t eat dinner, but pecked on some appetizers: edamame with maldon salt and lime, calimari, and crab cakes with shitake and asparagus. The edamame were good, if not a bit too overloaded with the salt. They also could have been cooked a wee bit more. The calimari was ok, certain bites were a bit too spicy. 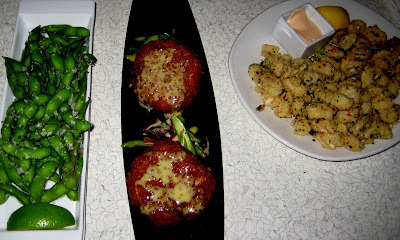 The crab cakes were good, especially with the asparagus. We tried the honey wheat, amber beer, and schwarzbier. The honey wheat smelled funny, but it was alright. The amber was pretty good, and the schwarzbier was my favorite of the night. The service was pretty good, they were attentive and quick to get rid of used plates. As the night progressed, the music changed and got about twice as loud. Also, more people showed up so it got even more noisy. That was a sign for me to skidaddle. Old City is not really my scene (but then what is really?) but it’s not a bad spot. If it’s crowded and loud it would be just as terrible as any of the other spots, but earlier on in the evening, it was fairly nice and relaxed and casual. It’s all about the company anyway… and watching your friends get drunk. That’s fun any time and anywhere!